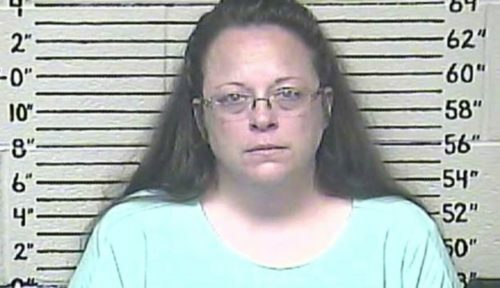 Kim Davis is going to pursue a career in evangelical ministry after she lost her job as a county clerk in the election. Davis rose to fame in 2015 when she refused to give a marriage license to a gay couple – citing her religious beliefs – after the Supreme Court legalized marriage equality in every state. She then said that she would give no one a marriage license, so that she would treat everyone equally. A judge told that she had to issue marriage licenses, and she spent several nights in jail for contempt of court when she refused to follow the judge’s order. Last week, Davis lost her reelection campaign for County Clerk in Rowan County, Kentucky. Staver didn’t say what kind of ministry she would get into. Since her refusal to do her job because her homophobia, she has gotten considerable attention on the right, and her “ministry,” for all we know, may involve a presence in right wing media.